MBE magazine's contest winners announced and upcoming events. Winners were presented with a special awards plaque and pin to commemorate the occasion. The reception theme was “The White Party”, with all attendees donning white cocktail attire to celebrate the winners. This year’s winners are: Kelly Ireland – CB Technologies, Himanshu Bhatia – Rose International, Inc., Vivan Isaak – Magnum Group, Inc., Ranjini Poddar – Artech Information Systems, LLC, Sheila Steinhouse Lee – Sheila Lee & Associates, Hannah Kain – ALOM, Tierra Kavanaugh Turner TKT & Associates, Inc., Denise Jones – Dnutch Associates, Inc., Betty Manetta – Argent Associates, Sonu Ratra, Akraya, and our May/June cover features: Christine Soward – Dayton Mailing Services, Carol Nance – Nance Carpet & Rug Co., Inc., Pat Watts – FCI Management, Vasanthi Ilangovan – VIVA, USA, Inc.,. “We’d also like to acknowledge our sponsors whose generous support made this special occasion possible…” said Ms. Oliver. Corporate sponsors include Macy’s, Kaiser-Permanente, Rose International, MGM Resort International, Artech Information Systems, Southeastern Grocers, Red Kite Business Advisors, Allstate, Shell, Johnson & Johnson, and Mosaic Global Transportation. One of the upcoming major events for MBE magazine is the NMSDC (National Minority Supplier Development Council) National Conference to be held in San Diego, CA in October. This conference gathers certified ethnic Minority Business Enterprises and corporate members who support supplier diversity from around the country. 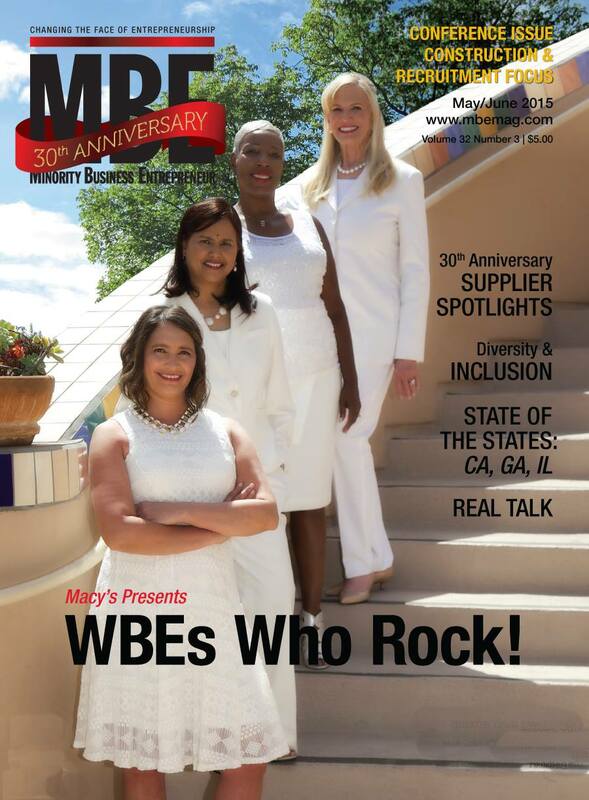 As such, MBE magazine has decided to host the first annual “MBEs Who Rock” contest, following the same criteria and format as the “WBEs Who Rock” contest. All companies and businesses who support minority owned businesses and supplier diversity are invited to nominate a minority business who exceeds expectations in business, but also supports their local communities and causes. Details will be published in MBE magazine’s upcoming e-newsletter and nomination forms will be available online in August. Until that time, for questions about sponsorship or nominations, please contact info@redkitesite.com. About MBE: Minority Business Entrepreneur (MBE) magazine is published bi-monthly by Enterprise Publishing Inc. and serves as a nationwide forum for minority and women business owners, corporations and government agencies concerned with minority and women business enterprise development. Founded in 1984 by Ginger Conrad, MBE magazine maintains a strong commitment to economic parity as a lasting solution to the ills of poverty and discrimination.